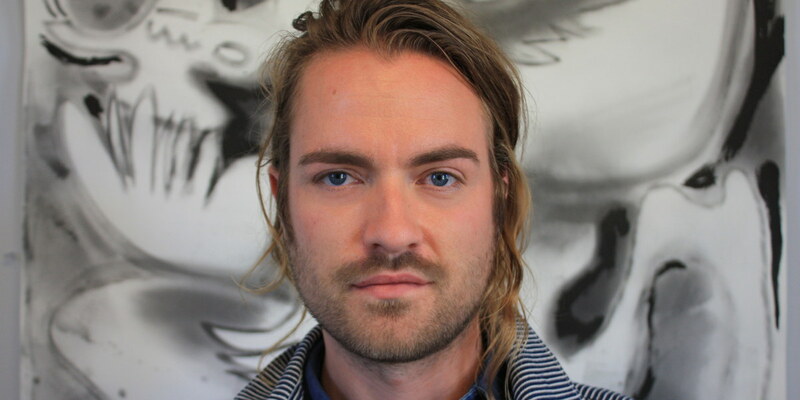 Brian Scott Campbell is a young contemporary artist with a very specific visual language. Campbell was born in 1983 in Columbus, OH and currently lives and works in Joshua Tree, California. Campbell recently relocated to the high desert after living in Santa Barbara, California, and prior to that in New York. He received a BFA from Columbus College of Art and Design (2005) and an MFA from Mason Gross School of the Arts, Rutgers University, NJ (2010). He has been included in exhibitions at Dutton Gallery, NY Asya Geisberg Gallery, NY, Metropolitan Art Society, Beirut, (Curated by Suzanne Geiss Co. NY), Jeff Bailey Gallery, NY, David Shelton Gallery, TX, Circuit 12 Contemporary, TX, and Untitled, Miami Beach among others. Campbell’s work owes a great deal to the Chicago Imagists, or Hairy Who artists, such as Jim Nutt and Karl Winsum, pop artists, such as John Wesley and early Sigmar Polke, as well as late Phillip Guston. Campbell’s recent work also calls to mind the great Modern ‘Outsider’ painters, such as Dubuffet and Rousseau, as well as outsider-influenced modern painters, such as Paul Klee. Campbell seems to derive further inspiration for the most energetic works from the Italian Futurist painters, such as Umberto Boccioni and Giacomo Balla. However, despite the clear interest in modern painting and expressionism, Campbell is dedicated to the mechanical application of traditional drawing materials. All of Campbell’s works are on paper and employ liquid graphite washes and pencil, as well as ink or gouache applied with brushes. 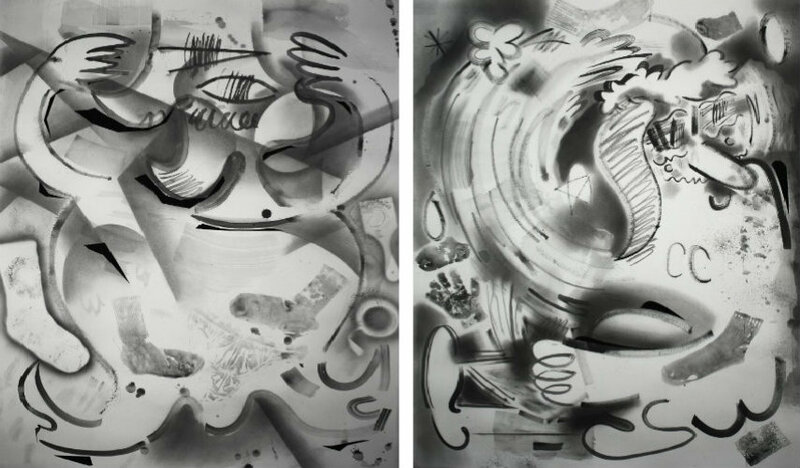 The drawings are limited to monochrome yet employ an indulgent use of techniques and tools from printing with socks and underwear, to painting with graphite washes through spray bottles and rollers. The silvery gray tones in these drawings display delicate lines with great sensitivity, yet the works remain frenetic and primitive. These works are precise and tight at times, and often they are wild, unwieldy, and unruly. Campbell begin’s the drawing and painting process with a fast, gestural sketch, or possibly a few written words, short prose, or title. Campbell keeps a sketchbook, but it is often cheap newsprint paper, or A4 computer paper, bound together within a binder. Campbell’s subject matter ranges within his recent work (2014-2016), focusing on the abstracted figure in motion. These figures are often drawing themselves, sweating in the artist studio, or jotting a note onto paper in a frenzy, and sometimes visibly distraught. He has focused on drawing figures that are either running or playing a sport. The limbs and appendages of the figures are languorous, exaggerated, stretching across the boundaries of the frame, or flying out of the frame. The results are highly energetic, and exuberant. Campbell’s work has shifted in subject matter in the last several years, moving away from landscapes and still-life. 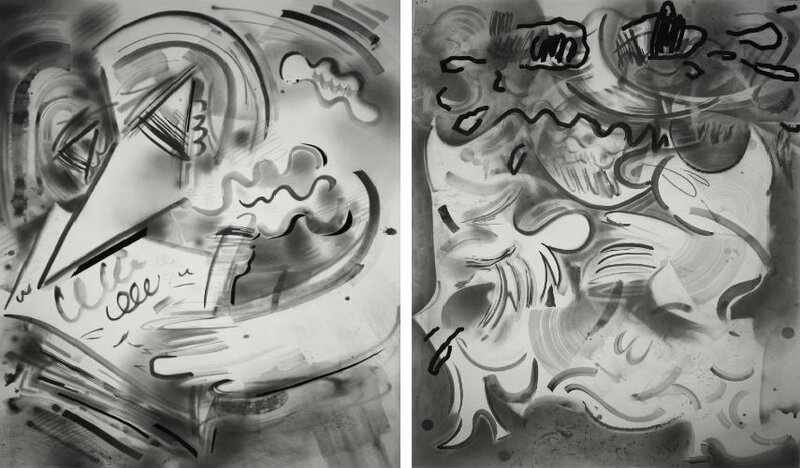 His drawings have become increasingly more abstract and less persuasively representational over the years. 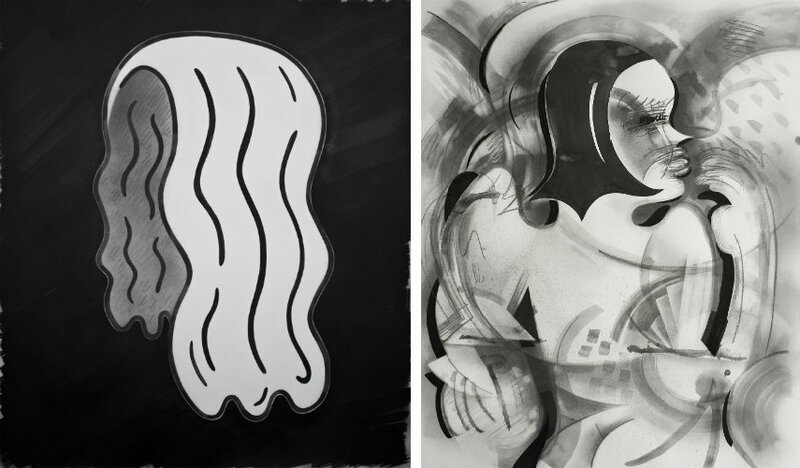 Campbell recently presented his first solo show at Dutton Gallery in New York and is included in a show that opens next month at Fredericks & Freiser in New York. Brian Scott Campbell lives and works in Joshua Tree, California.